This post is brought to you by Belo Baby. I'm a mom of three boys and I believe kids should get their hands dirty. Yes, boys and girls. Let them crawl on the floor, climb trees, dig their hands in the dirt, play in the mud, pick up pebbles, crush leaves, poke bugs, shake hands, hug, kiss, and just enjoy the world around them. I really believe that play is our children's best school and I'm not going to let my fear of germs stop my kids from learning in the best possible way. That said, I do have a fear of germs. That's why I have rubbing alcohol and hand sanitizers with me all the time. I know! What a strange life we moms lead! Ever since my two older boys started going to school, they've been coming home with sniffles. I super hate germs! So I super love finding products that can keep my kids clean and safe, and I got a new find for you! Mommies, I've fallen in love with Belo Baby hand sanitizers! I discovered Belo Baby last year and we're still using it today. When I found that the baby brand has a new product—hand sanitizers!—I was so happy. My second boy, Iñigo, is especially fond of the baby colognes so I said, "Hooray! Iñigo will enjoy spritzing these hand sanitizers on his hands because he loves smelling good!" Like Iñigo, I love smelling good. 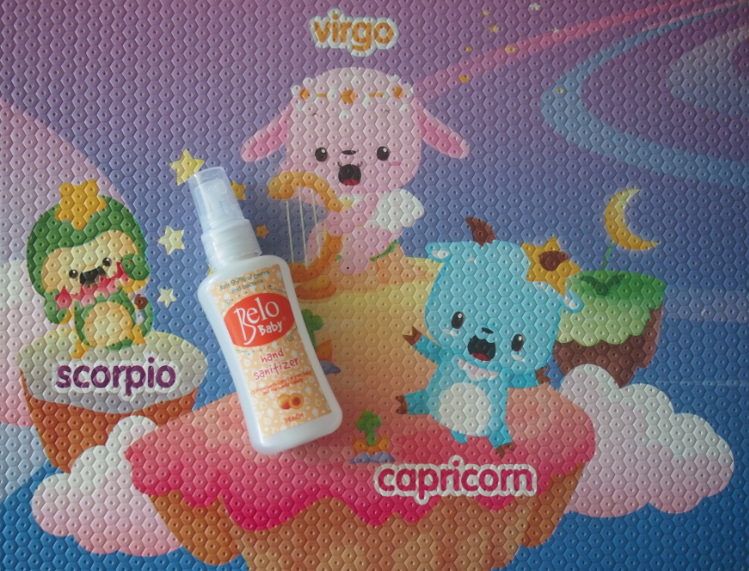 I especially like the fruity fragrances Belo Baby hand sanitizers come in: peach, blueberry, and green apple. I like peach best because it's a fruity floral and I love fruity florals—there's a warmth and lightness to scents like these that remind me of early summer mornings, when the day is just about to get hot and the world is quietly bracing itself for the unrelenting heat. Blueberry smells light and fresh. Green apple has a slight muskiness. I'm sensitive to scents but I like these. Hindi matapang. And hindi amoy alcohol. I mean, I don't mind the scent of rubbing alcohol but my kids do. It reminds them of hospitals and shots so I'm glad these Belo Baby hand sanitizers smell like colognes. Just a little note: these are NOT colognes. The smell dissipates after a while. So please don't use this as colognes for your babies and kids! These may be mild to skin but they are still germ-killers so please don't spray your kids' faces and bodies, especially private parts, with these. 1. Kills 99.9% of germs and bacteria. Many infectious diseases are spread by touch. Keep hands clean! As a mommy who wants her kids to have fun while learning, play is important to me and yet their safety from germs is just as essential. As a working mama, I am affected doubly when my kids get sick. I can't work! So I've found a happy middle—my kids can play all they want and still be germ-free with Belo Baby hand sanitizers. Belo Baby is truly crafted with care for the most delicate skin, for the most meticulous moms. And for only P49.75! Sulit talaga! To know more, check out www.belobaby.ph, like them on www.facebook.com/belobabylove, and follow @belobabylove and #BeloBaby on Instagram and Twitter. Mas safe ata to ' kaysa sa alcohol na ilagay sa bag ng pre-schooler ko. Can't wait to discover Hong Kong this 2017! Unboxing: Starmobile UP Sense phone + giveaway!